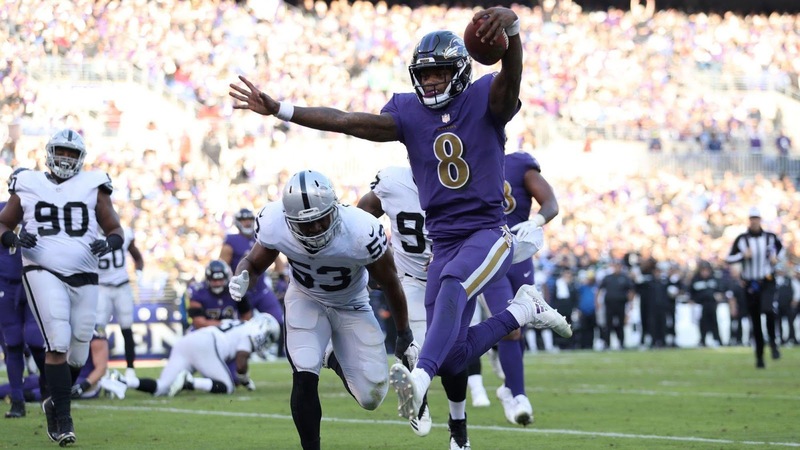 Home / 2018 Baltimore Ravens season / 2018 NFL season / Baltimore Ravens / dual-threat QB / Joe Flacco / Lamar Jackson / NFL / Ravens / SOTBSports / time for a change / SOTBSports: Is It Time to Let Lamar Fly? Anyone who knows me knows that, even though I don’t watch the NFL like I used to, I still keep up with the Ravens. That said, the last two games, I’ve been in tune with even more so for one reason: there is a proverbial passing of the torch going on at M&T Bank Stadium. For those unaware, the Ravens are at a crossroads at the quarterback position. 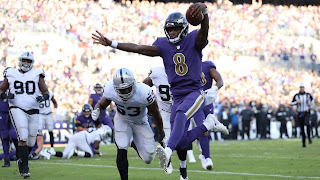 Incumbent QB Joe Flacco has been out of the line-up for the past few weeks and, in his place, rookie and heir apparent Lamar Jackson has led the team to two victories with his feet and his arm. Has it been perfect? Hell, no. Jackson is a rookie and he’s prone to make rookie mistakes. I mean, he threw two picks in the Oakland game yesterday. Even legends in the making like Patrick Mahomes—and establishes legends like Drew Brees—weren’t perfect during their first year. However, Jackson brings something to Baltimore that has never been seen for the Purple and Black. He’s a dual-threat QB in the vein of Kaepernick and Vick that is exciting to watch and frustrating to opposing defenses. Granted, the Ravens have played two of the worst defenses these pst two games (Cincinnati and Oakland). But he’s effectively carved up both squads like a veteran with his legs and his passing game (which still has room to grow). With two gimme games in the books for the Ravens, and defenses who may be susceptible to a dual-threat coming up, we’ve got to wonder something. Is it time to let Lamar run wild on the NFL? I’ve mixed feelings about this. On one hand, he’s exciting, he’s new, and he has proved he can throw AND run. However, Flacco is, right now, the more accurate QB. Flacco has more experience in playoff-like games. And the Ravens are still on the hook for a boatload of money for Flacco for 2018 and possibly 2019. Then again, the Ravens limped to a 4-5 record with Flacco at the helm this year. The running game stagnated with Flacco chucking 30+ passes a game. With Jackson, the run has opened up more because defenses are scared that he could take off just as quickly as he could hand it off or throw the ball downfield. The playbook is less dink-and-dunk passes and more versatile. That’s got to be worth something, right?